A Reference Guide to References! Have Questions About Our Free Resume Builder? But hold on, come back just a minute – Fido will have to wait. Yes, your resume is great…except for the last line: “References Available Upon Request”. I’m really glad you have references – they are an important part of a job search, but that line does NOT belong on a resume, so please remove it. 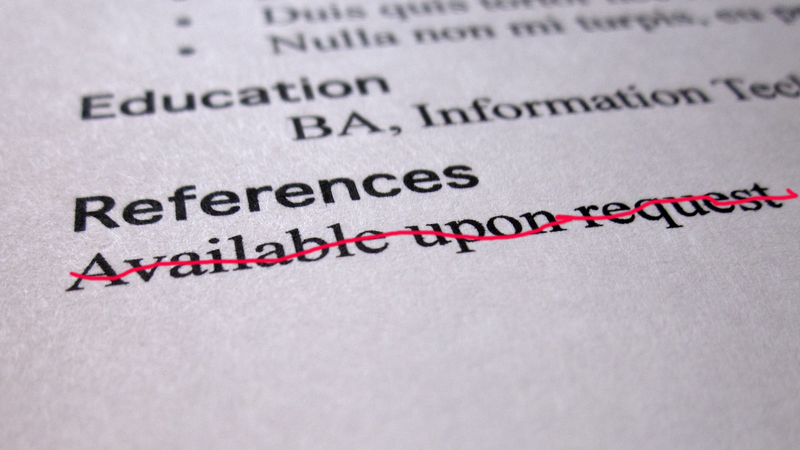 The ‘References’ component in a job search needs to be handled separately from your resume; in fact, references have nothing to do with what’s on your resume, and they therefore deserve their own space, so create a ‘References’ page. The format for your ‘References’ page should resemble the same as the one for your resume; same font, spacing, letter sizes, etc. Your references should be separately numbered – three references should be a sufficient number. For each reference, you should list their name, job title, company where they work, address, phone number and email address. Your best reference(s) should be at the top of your ‘Reference’ page.